Busy week at work so this is the training report for both classes (Tuesday and Thursday). Osoto- Gari for Ukemi (Judo throw drills). Tuesday topic was knee on the belly. We went over the concept of Knee on the belly and escape. We covered the baseball choke from KOB and one variation. Also we taught the far arm bar from KOB. Thursday topic was guard subs: Kimura, Triangle (gi and nogi), triangle. Jose who was promoted to blue belt. Mario got his second stripes on his purple belt. 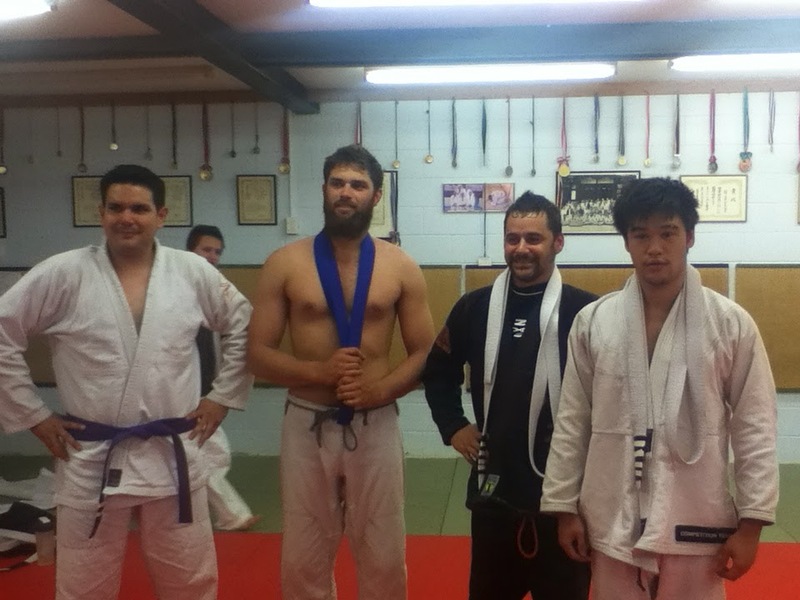 Marc and Webber received the fourth stripes on their white belts. Next week topics, guard passes and guard sweeps. Thanks to the staff of Tanuki Cave for the great hospitality and food. We had our competition after party at this great Japanese restaurant.